It’s Brain Awareness Week, a week-long effort to increase public awareness of the progress and benefits of brain research. Which got us thinking: What kind of advice did people get about taking care of their brains hundreds of years before the advent of brain imaging? A home remedy guide from our collection provides one answer. Like many tomes of its day, the book has a long and descriptive title: A Rich Store-House or Treasury for the Diseased: Wherein, are Many Approued Medicines for Diuers and Sundry Diseases, Which Haue Been Long Hidden, and not Come to Light Before This Time; Now Set Foorth for the Great Benefit and Comfort of the Poorer Sort of People That are not of Abillitie to Go to the Physitions. So what does A Rich Store-House have to say about the brain? 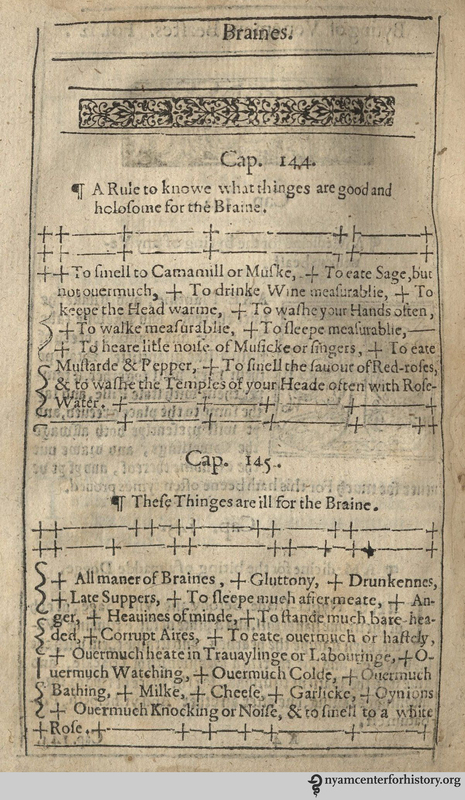 It offers two lists, “A Rule to knowe what things are good and holesome for the Braine” and “These Thinges are ill for the Braine.” Some of the items, like washing hands often, walking, sleeping, and eating and drinking in moderation, are still considered wise advice today. Others, like not listening to much music or singing or not eating onions and garlic, have not aged quite as well. 2. Geshwind, M. (1997). 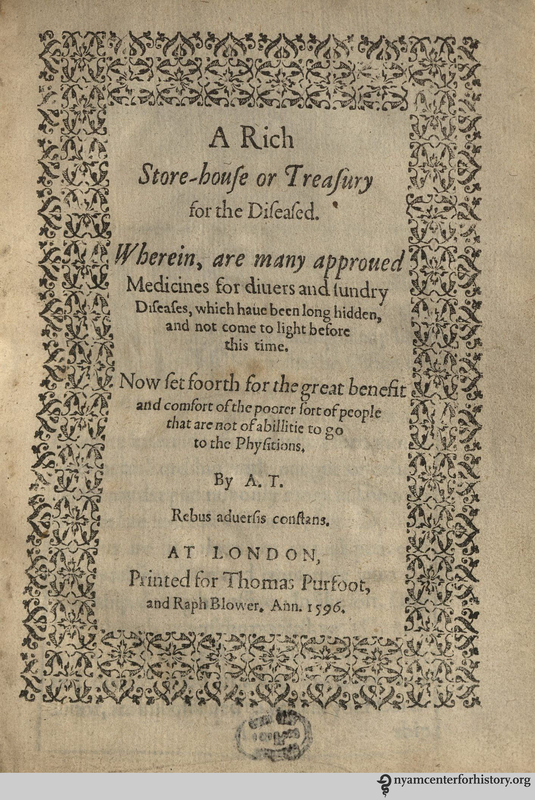 A rich storehouse of medicines for diverse and sundry diseases, an Elizabethan “Treasurie for the poorer sort of people”. Journal of the History of Dentistry, 45(1), 17–22. This entry was posted in Collections, History of medicine and tagged A Rich Store-House or Treasury for the Diseased, brain, brain awareness week, home remedy guide by nyamhistorymed. Bookmark the permalink.